We first became acquainted with Kate when we started tanking the North Platte river a couple of summers ago. Our favorite tanking route ends right at her property, and while we take out on the opposite bank, our acquaintance has led to a friendship. She is a frequent guest at our House Concerts, and is one of the most thoughtful, free-spirited individuals I know. 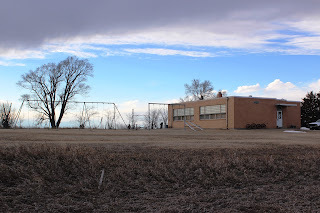 As much as she loves her home along the North Platte River, circumstances dictate that she sell it, and to that end, I have taken some photographs of her beautiful home and am blogging about them, in hopes of generating interest in the right places and bring about a sale. This big, beautiful 2000 square foot farmhouse was built in 1910. Yes, that's right - this year marks the 100th anniversary of the construction of this wonderful home. Two of the outbuildings on the property are a garage with room for a vehicle and additional storage, and a three-stall horse barn. Kate hosts a horse motel for traveling equine enthusiasts. As you can see, the exterior of the house has been completely updated, yet retains the historical feel. It is surrounded by a white picket fence, and has new siding and all new windows. The mature trees surrounding the property offer dense shade in the summer that cools our hot humid days. Inside it is a treasure! High ceilings, hardwood floors, wonderful light from the numerous windows, completely refinished woodwork and fresh paint have all been done just right! As you can see, the front room, which originally would probably have been livingroom and parlor, has been opened up to provide one large airy space. What I didn't get a good picture of is the half bath (also completely redone with all new fixtures), which is the door you can see in the far back right. Here in the dining room, you can again see the spacious dimensions of the room, the well-done woodwork and the creative and whimsical staging, which gives testimony to the character of the charming woman who lives here. The door to the right of the picture opens onto an enclosed porch which boasts a wood burning stove and the laundry room. You wouldn't expect someone with Kate's kind heart not to open it to four-legged creatures, and that area is home to her many dogs and cats. The dining room opens onto the kitchen and the quaint staircase leading to the second floor. This is a view from the dining room back to the living room, showing the kitchen door and the staircase opening on the right. On the south wall, a large inset window adds to the charm and the open feeling of the room. Upstairs are the three roomy, beautiful bedrooms. This one is in the southwest corner, at the top of the stairs. Through this window, earlier in the spring, Kate spied a falcon chick that had been blown out of it's nest during one of our frequent violent storms. She rushed outside to rescue him, patiently coaxing him to eat over the next few days before she reintroduced him to his family who were overjoyed to see him. They eventually succeeded in teaching him to fly and survive on his own, and his now once more a proud member of the free animal kingdom. Oh yes, and this also gives you a close-up of the new double-hung windows, which are energy efficient and make cleaning a breeze! The upstairs bath is really a charmer! As I mentioned earlier, the house is 100 years old, so this bathroom wasn't in the original builders plans! A converted bedroom insures that the bath is spacious and airy. This may also be a good time to mention that all of the plumbing, wiring and heating/air conditioning systems have been completely re-done. The large modern shower stall compliments the antique soaking tub. The binoculars on the chair attests to the wonderful views to the west and north from these windows. A converted dresser for the vanity adds just the right touch of history to this thoroughly modern room. Down the hall are two more bedrooms, one in the northeast corner and one in the southeast corner. All three of the bedrooms have roomy walk-in closets. This is the north bedroom, as you can see it has north and east facing windows - perfect light for an artist! Regardless of which room should be chosen for a studio, there is wonderful light at different times of the day in each. Back downstairs, to the wonderful country kitchen. While the formal dining room opens to the south, there is certainly enough room in here for a large table for your family and friends to gather around to enjoy delicious meals. The door to the left opens onto the laundry room on the enclosed porch. Again, don't forget that all of the plumbing has been redone. Outside, this is the east side of the house, and includes a screen porch and covered carport. The abundance of wood attests to the efficiency of heating the home with the woodburning stove. Past the covered parking, you can see the children's play area and a stock shed. Towards the rear of the property, a snug chicken house is just waiting to provide a home to your home flock of layers. Kate has a green thumb, and these beautiful flowers and herbs tell not only of her talent, but of the fertility of the garden plot. While not a very good picture, taken as it was at about 7:00pm, looking directly into the setting sun, it does provide a good view of one of the magnificent mature trees. Out front, this is the road that goes past the property. This view is looking south toward the hamlet of Sarben. While the property is secluded, you are only minutes from the town of Paxton, home of 5 Trails Winery, Ole's Big Game Lounge, the Windy Gap Saloon, and Hehnke's grocery store. All of these fine establishments have world-class reputations for their specialties. And this is the road looking to the north. This has been the starting point of many of our unforgettable Sandhill adventures. At one time a mail route, this road leads into the heart of some of the most beautiful country on God's earth. Let me say this at this point - you may be thinking that this beautiful retreat is out in the middle of nowhere, and you might be right - at least you can see it from here! But, I have perfect 3G and cell service from my Verizon phone, which I often use as an alternate to wireless Internet service. Kate neither wants nor needs television, but Dish Network or Direct TV can provide you with all of the channels you could desire. So secluded and peaceful doesn't necessarily have to mean cut off from civilization! And here is Kate's landing on the beautiful North Platte River! Water is precious, and Nebraska's weather is unpredictable. We are just coming out of a ten year drought. Lake McConaughy, which feeds the North Platte, is nearly at capacity, which means plenty of water flowing down the river. This has been a boon to us who enjoy tanking, tubing, canoeing or kayaking down the river, but it also means there's a limit to the lazy sand bars perfect for the youngsters or to search for beautiful rocks. Don't worry! Whichever river you like, it's bound to return! This is the river view of Kate's landing. While only a few feet off the road, it is far lower and secluded by large trees. Heading as it does up into the Sandhills, it is understandable that the road isn't very heavily travelled. This spot is just perfect for enjoying a quiet read on a beautiful afternoon, soaking your toes in the water if it gets too hot. Closer to the bank, you can see the underside of the Sarben river bridge. 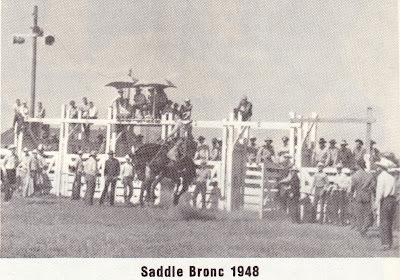 When I was a child growing up in the Sandhills about 30 miles north of here, this was our usual route into "town". At that time, the bridge was a rickety wood structure. The young me would scream at the top of her lungs during the entire crossing, absolutely sure we were going to plunge to our deaths in the six inches or so of water flowing under the bridge! Ah, the folly of youth. Looking across, you can see tubers picnicing on the opposite bank of the river. This bridge is home to hundreds of swallows who, like their cousins in Capistrano, return on the same day every year to build or repair their nests and raise their young. Their darting flights are not only beautiful, but functional - eating many times their weight in mosquitos. And the view from the bridge to the west, just at sunset. If you have followed this blog, you have seen this sight captured many times as we reveled in yet another memorable trip down the river. 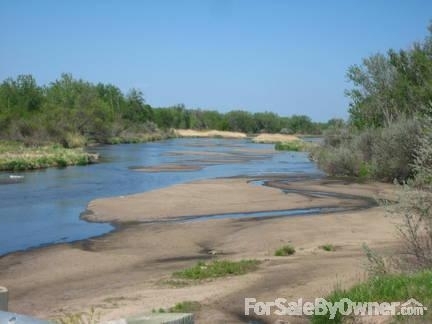 Small acreage (almost 8 acres) with easy access to your own private beach on the beautiful N. Platte river. Bathtub temperatures in the summer make sunbathing, swimming, colored rock collecting, tubing canoeing & throwing sticks for dogs to fetch a joy. A small lagoon on the soft sand beach lets toddlers wade safely in the water. Minnows, fish, herons, sandhill cranes, pelicans, seagulls, swallows, eagles, ducks, geese and songbirds grace the tree-lined river. Russian olive trees and grape ivy add a tropical fragrance to the air. The property has woods and fields, enjoying variation. I designed several separately fenced areas with top-of-the-line no-climb dog, horse and child safe fencing. "Mulberry Lane" is a lovely shady spot with 20 mulberry trees. 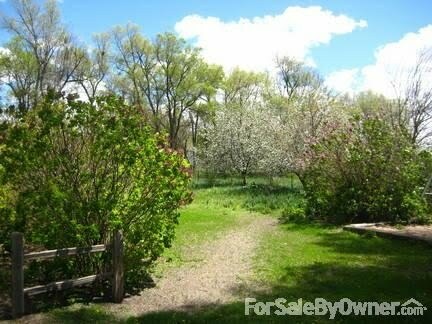 The large backyard has flowers, 3 big apple trees, lilac bushes, rhubarb, garlic, currants and wild ginseng. 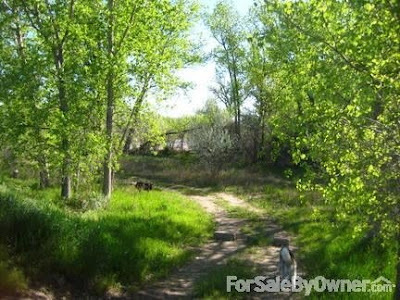 The front, back and side yards are surrounded by huge cottonwoods. The front of the house gives an unobstructed sunset view with the hills to the south and a tree line to the north. The river can be seen from one upstairs bedroom & large bathroom. The renovated two story farmhouse is simple and beautiful. It really feels like home! All 10 upstairs windows are new. There are 3 bedrooms a hallway & large bathroom with ceramic tile floor. Downstairs an open arrangement of livingroom, diningroom, kitchen, 1/2 bathroom, laundryroom and open space with ceramic tile & fireplace. There are 10 new large windows downstairs and a backporch. Floors are hardwood. Central heat & air, new plumbing and siding by Revere. There are 2 good outbuildings; one could be made into a guesthouse. Children have a choice of two excellent modern schools- one larger and one smaller. The bus comes to the front door. Easy access to I-80 on the county maintained road leads to North Platte (pop. 27,000) to the east. That city has good people and everything you need for the good life. (Hospital, college, shopping, restaurants, parks etc.) Denver, to the west is only a 3 hr. drive when you miss old friends, family or sophistication. Ten miles from home is a small recreation fishing lake. About 25 miles away is the huge Lake McConaughy with endless white sand beaches. Everyone who visits me for the first time is blown-away. The beauty of this place is obvious, but the thing that really overwhelms my visitors is the feeling of peace that overcomes them. The pictures of the river do not capture its beauty! The sky did not cooperate the day I had the camera. Wildflowers hadn't bloomed yet and two days of rain darkened the color of the sand. Yet, as I soaked in the sun while I stood in the warm water snapping pictures, with swallows flying all around me, with no one else around, I wondered how I could ever give up such a paradise! 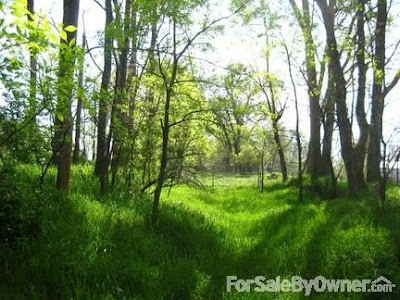 For the price of a modest house in the city you could own an entire world! I am computer illiterate. Please call 308-650-9510 and leave a message. 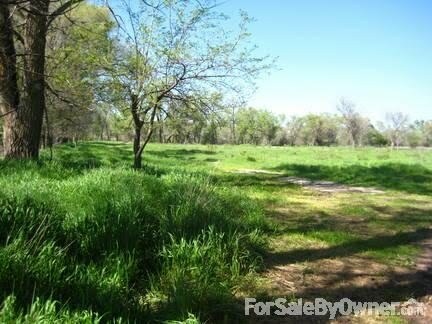 The pictures below are from Kate's listing. They were taken earlier in the spring, when all of her beautiful paths and special areas were easier to see and photograph. The nearly eight acres is a combination of woodland and pasture, which at one time was planted into alfalfa. 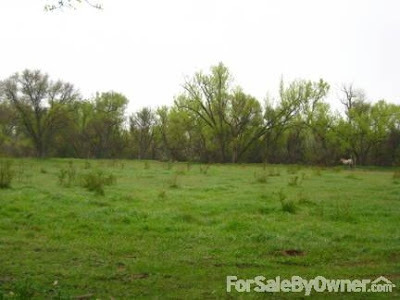 These pastures could easily accomodate multiple horses or other farm animals. These peaceful paths just beckon you onward toward your own personal adventure. Or maybe it's not adventure you're looking for, but peace and solitude - you'll find it here, too. Even looking at these pictures and remembering my recent visit to Kate have started the creative juices flowing. Just what I needed to get back into the blogging ritual (that and my restored home Internet!). So whether you're a young family looking for a home where your kids can stretch their legs and their imaginations, an artist seeking your muse, or retirees looking for a project as well as a home, this is the place for you. Can't you just see yourself walking these paths as the trees begin to bud out in the spring or the leaves begin to turn in the autumn? Or what about on a fine crisp winter morning with snow crunching under your feet and ice crystals shimmering in the sunlight on all of the trees. So how about it? 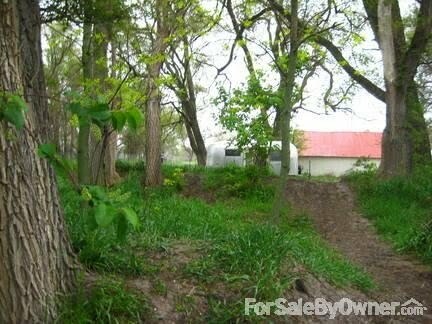 Go to Kate's listing on ForSaleByOwner.com, get all the details and become our neighbor. We'll stop by with a homemade cake and an invitation to a House Concert, tanking trip or a cruise in the delightful Sandhills. This property is so beautiful, I would be heart broken to leave it! I will be tweeting and reposting your information! Has she thought about posting this on Ebay. You would not have to auction it but pay a fee to have it listed. Thank you so much for your feedback and your offer to repost. I'll tell her about the Ebay suggestion. We'll be sad to see her go, but it really is too much for her.